When developing, funding, scaling and evolving innovation projects, it's key to gain insights from around the world – and to keep consumer top of mind, HIMSS innovation expert Ian Hoffberg says. In his role as Applied Innovation Manager in the office of the Chief Technology & Innovation Officer at HIMSS, Ian Hoffberg has a front row seat for the dizzying change going on in healthcare around the world. In fact, one metaphor he uses for his day-to-day work – keeping plates spinning in the air – gives a sense of the thrilling momentum he feels happening across so many different facets of healthcare, as information and technology both evolve. As applied innovation manager, Hoffberg works with the 18-member HIMSS Innovation Committee, a group comprising forward thinking execs and leaders, from across the healthcare and technology industries, that helps shape the ways innovation content and strategy is developed at the global not-for-profit. He also helps manage the larger but similarly diverse HIMSS Innovation Community, some 10,000 members strong, which gathers quarterly to share ideas about how they're fostering new ways to drive quality outcomes, lower costs and improve the patient experience. It's a big tent, but Hoffberg said it should be even bigger. Because really, if you're a HIMSS member at all, "you follow innovation," he said. "That's why you're here. You want to learn what's the next trend, the next solution to the challenges we face in healthcare. So, personally, I joke that all of HIMSS members should be considered HIMSS Innovation Community members." As more and more Innovation Community members get up to speed with the massive changes that have been happening for the past decade-plus, the questions they're grappling with have matured into complex innovation how-tos, he said. "How do you secure the funding? How do you do the scaling? How do you partner with third parties? How do you use APIs and open source technologies? We're exploring all these factors that help healthcare organizations innovate." Hoffberg has seen healthcare and health IT come a long way over the past two decades. It's where he's spent his entire career – starting in the 1990s, just out of college, at Memorial Sloan Kettering Cancer Center in New York. Even in those early days, innovation was bubbling up. "That's where I first saw an EMR and point of order system: It was so revolutionary for the time – all built in-house, all built according to what the physicians needed," he said. "The biggest challenge was making sure people use it. Because it was a new technology. And one of the biggest challenges was just getting physicians to place their orders and for nurses to use the order system." "We need to make sure that all of healthcare is firing on all cylinders and providing that high level of care. Healthcare isn't the same in a big city as it is in rural America." But when tools such as those were able to gain traction, "that's when I first saw technology making a huge impact in the daily application of healthcare, and providing of that higher-level care for the patients." Next, Hoffberg worked at athenahealth, where he worked as a clinical operations senior analyst. In its medical records quality assurance department, "we were intercepting every fax that was going into the practice, manually entering all the important data fields," he said. "You don't have enough time in the day to process that amount of work, so they started developing more in-house solutions to help properly manage the volume of data we were receiving," he explained. "It was fun to work with our QA team and our coders to develop a document recognition system: fine tuning what it is we were looking for and, again, providing higher-level care by reducing errors and using technology to get physicians those documents in a much faster and more reliable system." From there, Hoffberg moved to the nonprofit side – first with a stint at the National eHealth Collaborative, focused on the consumer experience, and then to HIMSS. It's there, even though his work focuses on all corners of the healthcare industry, that "the voice of the patient started ringing so loudly for me. And once you ring that bell, you can't unhear it," he said. "Utilizing technology to care for the patient – in a way that the patient can use, and is of benefit to them, started changing the game," he explained. "We need to let the patient have a seat at the table, because they're the ones that are directly impacted by all the different apps and technologies coming out." And, indeed, for the first time in recent years, it's become more and more apparent that consumer tech is pushing healthcare in directions it might previously have been reluctant to go. "Technology is catching up to the point where it is surpassing the abilities of the healthcare industry," said Hoffberg. "The expectations have changed drastically in the past 10 years. The technology has provided an environment where we can no longer do business as usual." And not only do we "need to use the technology that is out there," he added, "we need to use the tech we have in more efficient ways. Innovation is not just developing new, fabulous technology – it's also using current technology in a smarter fashion." Need proof? Just look at any number of HIMSS Davies Award winners. "They take their EMRs, just tweak the dashboards ever so slightly and they're reducing sepsis, reducing readmission rates – they're using the technology in a new way to have it work for them and for the patient," he said. HIMSS itself has seen a "fundamental shift of agenda over the past year," Hoffberg pointed out. For instance, CEO Hal Wolf has reemphasized the vast international reach of the cause-based group and new Chief Technology and Innovation Officer Steve Wretling is pushing to further engage tech developers and innovators of all stripes, all over the world. "How we're going to focus on innovation in healthcare is changing," Hoffberg explained. "HIMSS is a global enterprise. And what we need to do is partner more efficiently with our European partners, our partners in Asia and the Middle East, etc. So we can start sharing our stories more on a global scale." After all, he said, "best practices we have here in America may be best for certain scenarios, but there are also partners in Europe who are approaching consumer engagement, for instance, in a different way and having more success with it. There are great success stories out there, and that's one of the things we're trying to work on with the HIMSS Innovation Committee – bringing more of a global, relevant content portfolio to the table for our members." Toward that end, HIMSS will soon be releasing some new research to help hospitals and health systems better understand the organizational characteristics and attributes that are key to facilitating an innovation culture. 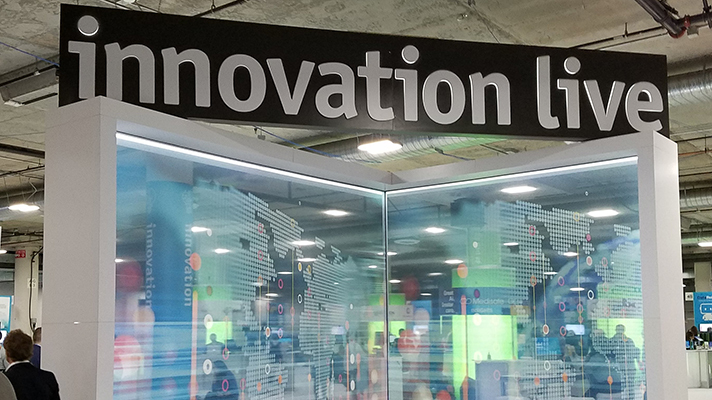 That research, scheduled to be released this fall, can be used to help healthcare organizations assess their own innovation-readiness – and tap into other prescriptive innovation-related content and resources at HIMSS. In the meantime Hoffberg, alongside with colleagues, Justin Gernot, vice president of HIMSS Healthbox, and Adam Culbertson, HIMSS Innovator in Residence, will be presenting a webinar, What Innovation Means to Healthcare and Why it Matters Today, on September 28. Right now, Hoffberg is still thinking about the patient experience. Specifically, not surprisingly, he's interested in how "these new big players on the healthcare scene, the Apples and the Googles, these big, consumer facing entities," will continue to reshape it. "I think there's going to be a tremendous shift over the next five to 10 years," he explained. "You're going to see a run to keep up with the industry by a lot of health systems and providers to make sure they're providing that expected level of care moving forward." And while Hoffberg is clearly bullish about innovation's forward momentum, he's also clear-eyed enough to realize that "we're going to have some failures." But we're going to learn from those failures," he said, "and that's how we're going to build a bigger and better ecosystem to deliver healthcare for our patients, and create something that isn't too cumbersome for our physicians and nurse practitioners and our hospital staffs." Earlier this year, Hoffberg broke his leg while skiing in Utah. After receiving treatment, he travelled home to Virginia – before moving, a few months later, to Texas. "With the trail of my care plan, moving across the country and then back across a second time, you can see the inadequacies in the healthcare system," he said. "We talk about technology making a difference, but there are still a lot of pain points out there." More and more, forward-thinking hospitals, health systems and tech vendors are coming up with new and creative ways of alleviating those pain points. But it's important that those innovations are distributed as far and wide as they can be. "We need to make sure that all of healthcare is firing on all cylinders and providing that high level of care," said Hoffberg. "Healthcare isn't the same in a big city as it is in rural America. With more and more technologies coming out, we need to make sure that everyone is brought along for the ride and doesn't fall behind."